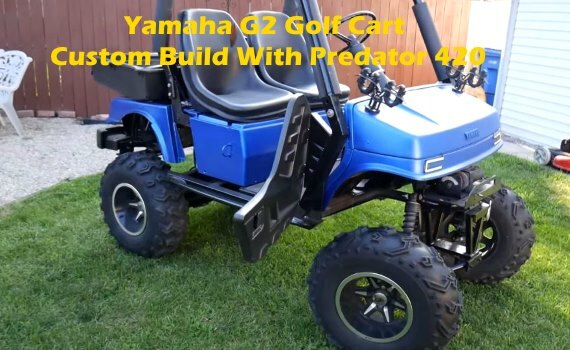 Taking a look at this custom built Yamaha G2 golf cart with Predator 420 motor from Harbor Freight. This nice looking Yamaha G2 has been lifted with a custom suspension, new side by side doors, LED lights, a winch, and fishing rod holders. The G2-G9 model golf carts from Yamaha had an in-house built 4-stroke 285cc with 8.5hp, this coming by way of a single cylinder engine. The newly upgraded Predator 420 comes in at 13hp stock with room to be upgraded to even more horsepower. Thanks to Tuber Chuck Kososky for the video. You can find other Predator 420 golf cart builds here. Find Yamaha G2 cart parts here on the cheap.